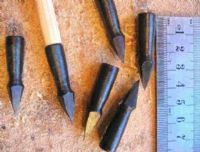 Hand forged arrow head by Hector Cole, this head is a hand forged copy of an original War Bodkin found at the Battlefield of Crecy in France. 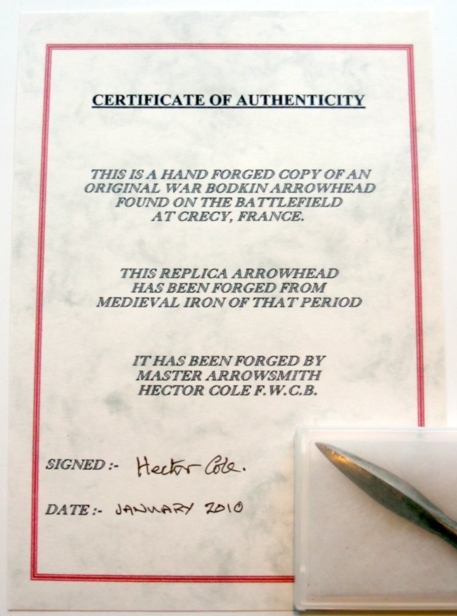 The head has been forged in Medieval Iron of that period and comes with a certificate of authenticity signed by Hector Cole, this can be seen in the pictures. Outside socket diameter 1/2" approx, length 2 1/2" approx, ALL SIZES/MEASUREMENTS ARE APPROX AND VARY AS THESE ITEMS ARE ALL INDIVIDUALLY HAND FORGED IN THE TRADITIONAL WAY. Ideal for Re-enactment displays etc. Sold in singles. POPLAR SHAFTS 3/8 to 1/2"